A Manchester removal boxes testimonial: "Thank you for your surprisingly quick delivery, we were delighted when you said you would deliver before lunch. We have never enjoyed such service before. The removal pack has proved to be ideal. Kind regards." We deliver high quality removal trade boxes direct to Manchester home movers every day of the week. All orders with a value of thirty pounds or more are delivered free of charge. Our comprehensive range includes: glass and crockery boxes, wardrobe boxes, home movers discounted packs, tape, bubble wrap, sofa covers, mattress bags, furniture protection, packing paper and tissue. The packaging materials we supply are exactly as those used by major removal and shipping companies. All the boxes we supply are twin wall trade standard. We do not offer single wall or lightweight material to home movers. All the box dimensions we quote are internal and all boxes are printed with fragile, this way up and handle with care messages. Customers are given a roll of strong bond tape with every 12 boxes. Each regular removal box has the correct taping method illustrated on one base flap. The packing and handling advice sheet we give to each customer urges them to copy this trade standard way of sealing removal boxes. Our free packing and handling advice sheet gives all our customers important cost saving information. Sections of this information have been published on this website. To ensure we continue to deliver exceptional value and service we only supply home movers within Manchester and the surrounding region. This means our shipping costs are low and are delivery times quick. The quality of our removal boxes together with our speedy response is helping us grow our business through recommendation and repeat custom. We believe that gaining trust is the most important element in all our dealings. The pages of this website are very detailed; we do our best to communicate the extent of our offer and the scale of our products. Whether you choose to purchase our materials or not, you will certainly be much better informed if you study the content of this website. 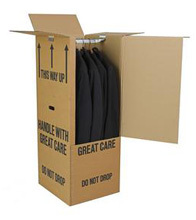 We offer free advice to Manchester customers on safe handling of our removal boxes. We deliver at agreed times, therefore all orders must be placed by phone. We can arrange daytime, evening or weekend deliveries in Manchester. - Call today and start to pack the professional way. Customers invariably express surprise at the scale and strength of our materials. We believe that you too will be delighted at the value of our offer. However, should we fail to meet your expectations a refund is assured, providing our products remain unused and undamaged.